When I first got an iMac with an Apple Bluetooth keyboard I instantly loved the keyboard. I preferred the size and I appreciated not having the wires. The one thing I missed was the number pad from my old USB keyboard. I used that number pad a lot. I am not a number cruncher, but the number pad made entering numbers into the computer a lot easier and faster. I haven’t had a number pad for years, but I still missed it, until I was given the opportunity to try out NewerTech’s Wireless Aluminum Keypad. It gave me back my number pad and it matches my Apple keyboard perfectly. It has the white keys and an aluminum finish (also available with black keys). In fact, it looks like something Apple would have made. The Keypad is about the size of Apple’s wireless trackpad, but about an inch narrower. It connects easily to your Mac via Bluetooth. It has all the functions you want and a few extras. It even brings back the good old Apple forward Delete key that only Mac users understand how to use when using a Mac. It always confused my Windows friends who typed on my computer. You know the one I’m talking about. It deletes from the right of the cursor instead of the left. One concern you might be having is that the Keypad will clutter up your desk space. You have the keyboard, a mouse or trackpad (or something else), and maybe some other things . Do you really need one moreaccesory on your desk? NewerTech has the clutter issue covered. The Keypad ships with a plastic bracket that connects the Keypad to your Apple keyboard. Both devices slide into the bracket, which also has special adhesive (tape) to hold the two together. You don’t really need the tape, and there are only two pieces. What happens when you need to change the battery in the Keypad and use the power button that is not accessible without taking the Keypad out of the connector? You either go without tape or find another solution. The connector works great and adds a 1/2 inch strip between the two pieces that blends in with the keys. The Keypad fits perfectly into its side of the connector, but I found the Apple keyboard doesn’t fit exactly into its side. There is always a tiny gap at the top that will not close. Not a problem at all, but an annoyance. Overall, the NewerTech Wireless Aluminum Keyboard is fantastic. 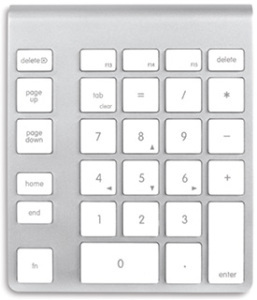 It brings back the traditional keypad plus more to the Apple wireless keyboard, for $54.95. This may be a bit pricey for some people on a budget. You can find Bluetooth keyboards for less than this product’s price with a keypad built in. 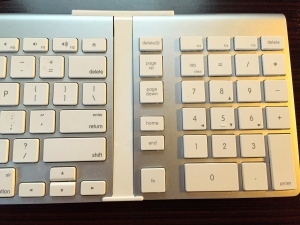 However, if you love your Apple keyboard, like I do, and you miss the keypad functionality, this is a no brainer. You are getting a great looking keypad from a company you can trust. As of this writing it is on sale for $47.00.